​43 years ago - Doc hatches on Aello. ​26 years ago - 17-year-old Doc leaves his pupal stage. ​16 years ago - 27-year-old Doc joins the science cast of Aello. ​11 years ago - 32-year-old Doc enters the science elite, constantly in conflict with the Citadel restrictions on non-governmental research. ​8 years ago - 35-year-old Doc replaces his own brain with a biosynthetic computer in direct violation of Citadel Law. He goes into hiding in his underground lab. ​5 years ago - 38-year-old Doc cracks a Citadel bio-weapon, saving billions. He is found and enslaved by the Citadel. ​4 years ago - 39-year-old Doc is saved by Tigorr & joins his crew. now - 43-year-old Doc joins Adam Strange's Omega Men to fight Lady Styx after the death of Broot. 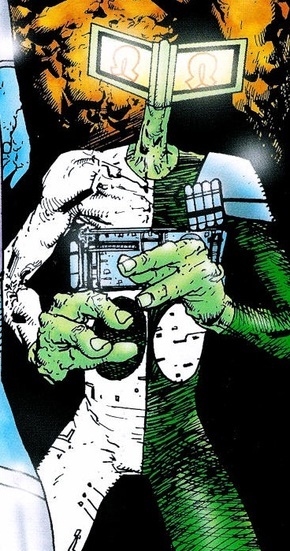 There are a LOT of members of the Omega Men; a large collection of ponderously weird characters with varying degrees of forethought in their design. Of all of those weird side characters Doc stands out because of his particularly weird silhouette. The idea that he deliberately made himself into a biological computer is a clever seed of an idea, so we expanded on it quite a bit. Making him a rogue scientist that has saved billions from Citadel bio-weapons makes him a fascinating character. 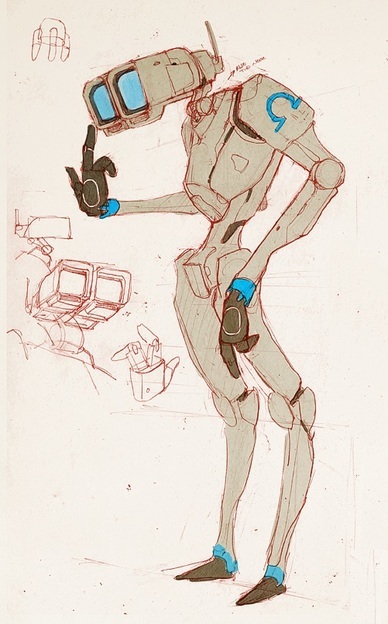 While he's often depicted as more robotic, he's far more interesting in his lanky biological form with his weird monitor-face, a character that is immediately repulsive and endearing. He's not a character that could ever sustain his own story, he's an absolutely fascinating addition to the Omega Men.